new artist for the site? Buy my CD today! Get a free decal and "I Support Texas Music" button! 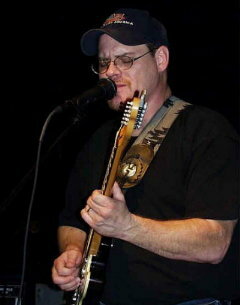 Rodney Pyeatt has played that sweet Telecaster for Selena and Rick Trevino, but now he's playing it for himself. 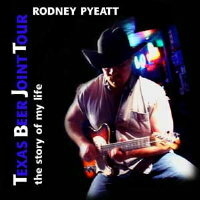 "TEXAS BEER JOINT TOUR" (Cedar Break Records) is the debut project from this veteran road musician. Penning six of the eleven cuts and co-writing two more, Pyeatt has delivered a radio-ready gem. From "In Texas," the opener, Rodney Pyeatt expresses the true Texan within him, blending Country music, Latin flair, and a relentless guitar solo. Pyeatt masters the softer side on "Suppose I Turn The Tables." Every track is a treasure unto itself, creating an outstanding first project. Pyeatt's voice has a Vince Gill quality, flawless and true to the last note. Since his teenage years, Rodney has performed "House Of The Rising Sun" so it's no surprise that you find it here, in his own unique style, including a nostalgic ending for all of us who spent our youth with one hand wrapped firmly around a Fender neck. Co-produced with Steve Palousek, Pyeatt assembles a Who's-Who of Country pickers for a CD that is nothing less than a Rock-laden Country smash hit factory. Rodney has spent his career making entertainers sound good. Now, it's his turn. A disc jockey's new best friend, this makes my top-ten list for 2002. Get it today for only $13.99!